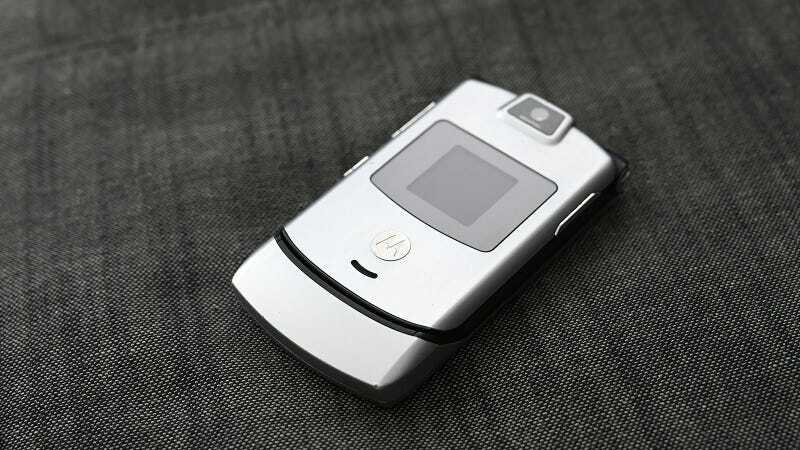 The Motorola Razr was undoubtedly the phone of the mid-2000s. It was a tantalizing vision of the future that featured a super compact body with slick metallic keys and two freaking screens. And while its debut in 2004 came about a decade and a half ago, if this new report from the Wall Street Journal is true, Motorola is going to try to resurrect the Razr for 2019. According to the story—which has the whiff of an intentional leak released to help fuel the hype—it seems that Lenovo (Motorola’s parent company) and Verizon have partnered to create a new Razr with a foldable screen that could go on sale as early as February, priced at around $1,500. Apparently, the new Razr wouldn’t just be a one-off, as the WSJ reports that Lenovo plans on making around 200,000 of the damn things. Even though the phone says my factory battery was invalid, after a quick charge, it booted without too much issue. Look, I get it. The Razr was cool. I still have one of the three Razrs I owned back in the day (the other two were irreparably damaged after I was pushed in a pool and hit with a hockey stick), with the lone survivor having lived through a car crash, multiple cross-country road trips, and more. But that doesn’t mean trying to revive the Razr is a good idea. Just from a design perspective, the temptation is obvious. If you could replace the inner screen and the number pad on the OG Razr with a flexible display that spans the phone’s upper and lower halves, that alone would be an incredible feat of engineering. But based on the handful of flexible phones out right now, I have strong doubts that any company, especially one not named Samsung, is ready to make a flexible screen that can bend like that and still make the phone thin and compact enough to be worthy of the Razr name, let alone get it to market in the first half of 2019. It’ll be almost impossible to make a bendy phone as thin or compact as the original Razr, so what’s the point? To add even more fuel to the fire, during the past two years at Mobile World Congress—the annual mobile tech conference in Barcelona—Nokia has gotten a fair bit of attention for its own retro revivals, including the reborn brick phone in 2017 and that slider phone from the Matrix in 2018. But for MWC 2019, which is coming up at the end of February, I’ve heard that Nokia may not be venturing back into the nostalgia tech mines, which leaves the door wide open for Moto. The real problem for Motorola, though, would be making this new Razr anything more than a feeble attempt to make people warmly reminisce about a long dead phone. The Razr was maybe the last great dumb phone before Apple released the iPhone in 2007 and turned the handset world on its head. Even if Motorola makes a new Razr with a flexible screen, would you actually pay $1,500 for one? Moto already tried to revive the Razr name back in 2011 with the Droid Razr, and while it was a nice phone for its time, it was ultimately a somewhat forgettable device that didn’t do much for the Razr name. Now that the idea is out there, I’m curious as hell what a modern Razr phone with a bendy screen would even look like. Just don’t get your hopes up that it’ll be any good.